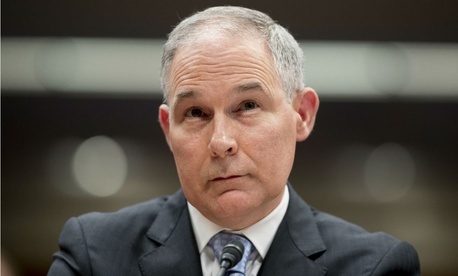 A federal judge on Friday scolded Environmental Protection Agency Administrator Scott Pruitt for failing to respond to a nonprofit’s Freedom of Information Act request for climate change studies Pruitt claimed bolstered his skeptical views. The agency also argued that the suit is “a trap” in the form of an improper “interrogation” and a “fishing expedition” to explore Pruitt’s “personal opinion,” PEER said in its release. Also on Monday, Pruitt learned that he is facing continued pressure from lawmakers on the issue of whether he misused federal employees’ time by tasking one of his top aides with working with real estate agents to find him lodging in the District Columbia. Newly released testimony by his aide Millan Hupp showed that her duties at one point included finding the administrator a used mattress from the Trump International Hotel. In a June 4 letter to House Oversight and Government Reform Committee Chairman Trey Gowdy, R-S.C., Ranking Member Elijah Cummings, D-Md., and Rep. Gerry Connolly, D-Va., asked for a subpoena of Pruitt’s documents related to their charges of “multiple abuses of authority in using agency staff for his own personal purposes” and violations of federal gift laws. Including long passages of verbatim testimony from Hupp, the Democrats said her comments show Pruitt used her for personal tasks such as booking personal flights with his credit card. EPA in April dismissed such reports as the product of a disgruntled ex-employee. They ask the chairman to require the EPA to produce documents by June 18 on the administrator’s use of staff for personal tasks.